On The Fall Docket: Who Gets To Vote — And Who Gets To Decide? August 25, 2014  A federal court will hear arguments Monday on whether Kansas and Arizona can require proof of citizenship when people register to vote. It's the first of a wave of voting law cases this fall. June 27, 2014  After trying out online balloting in elections in 2011 and 2013, Oslo has concluded that it didn't improve turnout and might undermine the democratic process. March 5, 2014  More than 800 million people are eligible to cast ballots to choose a new lower house of Parliament. 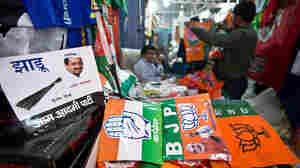 The vote, which observers call a defining moment for India, will start April 7 and last nine days. February 12, 2014  The election administration commission appointed by President Obama found no evidence that partisan plots were behind long Election Day lines, as some have suggested. Rather, some election officials simply misjudged how much equipment and personnel they needed at certain precincts. January 22, 2014  A bipartisan election administration commission, appointed by President Obama, delivered a list of recommendations aimed at dealing with the problem of long lines at polling places. November 8, 2012  President Obama, in his victory speech, noted that the hours voters had to wait in line are something "we have to fix." One solution: Spend more on equipment and poll workers. But that would be tough in this fiscal climate. Another is to expand early voting. 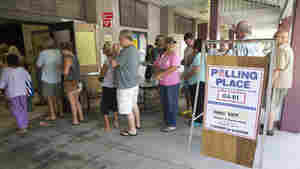 But states such as Ohio have had their early-voting laws challenged in court. November 7, 2012  You volunteered, you voted, but your candidate just lost. How do you deal? Psychology experts suggest taking some pointers from — of all things — die-hard sports fans. November 6, 2012  Election Day brought the usual reports of malfunctioning voting machines, and voting-rights lawyers said they received reports from Pennsylvania that some residents were erroneously being told they needed photo ID. But even in battleground states, there were few reports of major problems by late evening. 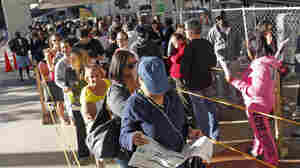 Voting Queue Etiquette: Hey, Buddy, That's Out Of Line! 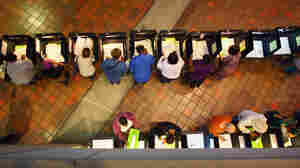 November 6, 2012  On or around Election Day, millions of Americans will show up at their polling places and settle in for what could be a long wait in line to cast their ballots. So how do you respond if the person behind you decides it's the perfect time to loudly express his political opinion? A look at what some voters say is OK and what's not at the polls. 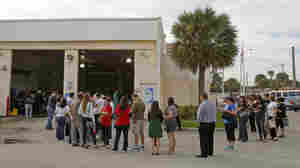 November 5, 2012  Early voting officially ended on Saturday in Florida. 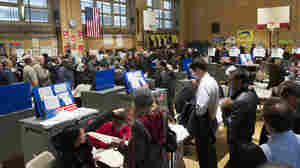 But legal challenges by Democrats opened up election offices in several counties on Sunday. Are You Responsible For The Outcome Of The Election? 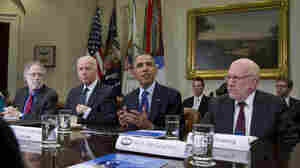 November 5, 2012  What does one vote matter, your vote? Clearly the election is not going to turn on your individual action. So where does the motivation come from to get up out of your chair and head to the polling station? Commentator Tania Lombrozo digs into the psychology of our decision to vote, or not. October 29, 2012  The fearsome storm has shut down early voting in multiple states and disrupted the presidential candidates' campaign schedules. 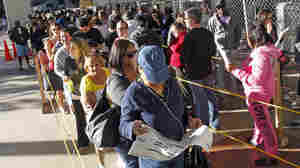 Sandy may wreak havoc as it claws up the East Coast, but voting experts say its impact may fizzle come Election Day. October 25, 2012  Frank Tanabe, who was in a California internment camp when he volunteered to serve in the U.S. Army, was 93. A photo of him voting from his deathbed went viral this month. October 23, 2012  Frank Tanabe, 93, is on his deathbed. But he wanted to vote one last time. The photo his grandson posted has gone viral. During World War II, Tanabe volunteered to serve in the military while being held in a California internment camp. Are Independents Just Partisans In Disguise? August 22, 2012  Psychology explains why people don't always do what they intend to do. 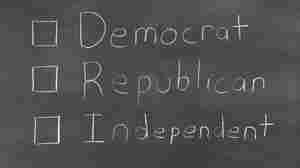 Can it explain why many independents vote along partisan lines?